While we are excited about Android’s in App billing (see Android Developer post, and TechCrunch article), we are disheartened that it is still not relevant for our a service such as ours. tapviva works with cafes and food trucks that process a high volume of low dollar amount transactions. 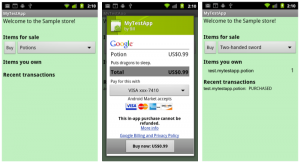 The in App Android billing takes a 30% fee per transaction. This type of cut for physical goods is simply not feasible. According to January 2011 research by Canaccord Genuity, in 2010 restaurant’s share of the food dollar was 50%, if in App payments take an additional 30% to other costs, restaurant models no longer stay viable. Thus, while the in App building may make sense for digital items and software where there is no additional cost per sale, it is not yet applicable for sale of physical items (such as delicious baked goods). We would like to see the rates more closely aligned to those of standard credit card fees. Isn’t taking 2.7% + 30 cents per transaction enough of a payment? It seems that the technology can absolutely handle this in App payment structure, but the business model has not caught up to capability or needs. 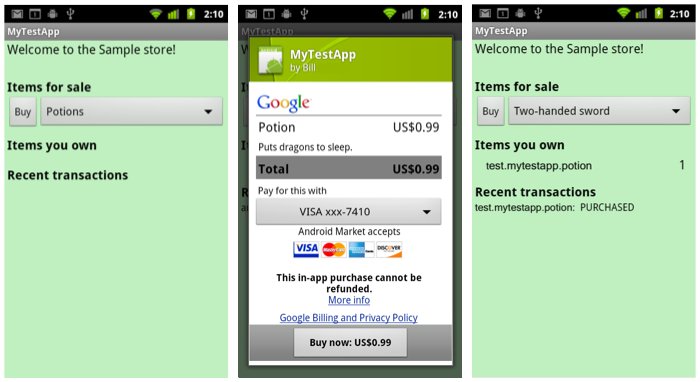 Usability aside, we wanted to see how in App payments actually work. We have tested in App payments with the Comics App from ComiXology. We are impressed by the ease of setting up an account and the link to the Android store when you purchase, but for some reason a $0.99 listed item became $1.99 when we got to checkout. Not sure where the issue is, but take this as a warning to check prices before checking out. When we tried to make a purchase with TapTapRevenge App – we had no idea if the purchase had actually gone through, no confirmation or way to tell if you already owned it. Are other people having the same issues with current in App payments? When do you think Android will have a model to support the purchase of physical goods?